Rail Minister Jo Johnson visited South Yorkshire for the long-awaited launch of a new tram-train service between Sheffield and Rotherham. A commemorative nameplate was unveiled at the new Rotherham Parkgate tram-train stop on 25 October and the first tram-train entered passenger service at 09.39 from Sheffield Cathedral. However, the celebrations were cut short when a number of passengers suffered minor injuries following a collision between a lorry and one of the tram-train vehicles shortly before 3:20pm that afternoon. Stagecoach Supertram said it was assisting police with their inquiries to establish the circumstances surrounding the incident. Jo Johnson (left) with Dan Jarvis. Supertram will run three tram-train services an hour in each direction between Sheffield Cathedral and Rotherham Central station, via Meadowhall South and Parkgate Retail Centre. The Class 399 tram-trains will be able to travel between the Sheffield Supertram network and Rotherham via a new section of track, known as the Tinsley chord, which connects the light rail system with the main line rail network. It is the UK’s first tram-train service and the two-year pilot will be used to judge the viability of other tram-train services around the country. In a statement, Rob McIntosh, route managing director at Network Rail, said the project had been complex and that it was “genuinely exciting” to welcome the first passengers. 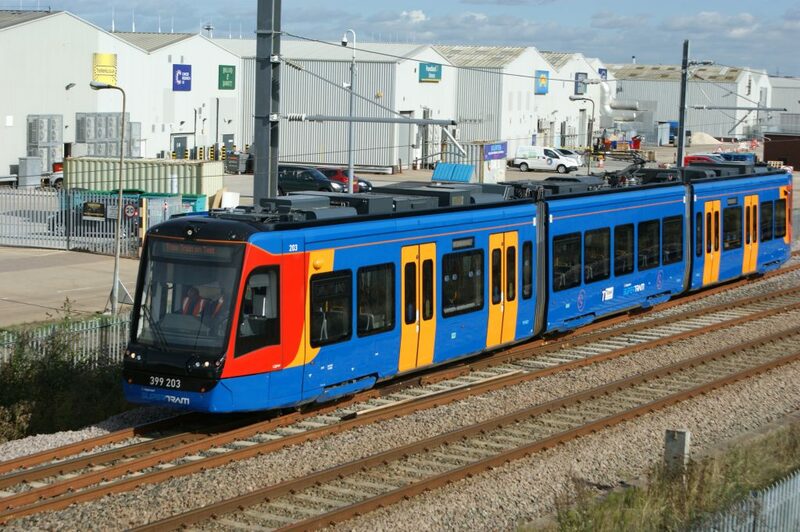 Stagecoach Supertram’s managing director, Tim Bilby, said the operator was proud to have been chosen to pilot tram-trains in the UK and that he was looking forward to hearing what passenger thought about the service.